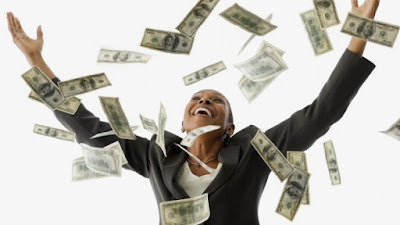 There are so many stories of how people lose their winnings when they have a windfall, such as winning the lottery. Here is a simple way to keep your windfall working FOR you for years! Let's say you've won the lottery. Let's imagine the smallest win in California which is $7 million. If you take the cash value of that win, you can say goodbye to 50% of the winnings. So, you actually get a lump sum of $3.5 million. Oh but wait, you have to pay your taxes! If you consider Federal and State Taxes subtract 40%. So, ultimately you will receive a check for $2,100,000 (they actually wire it to your account, but I digress). Now let's create simple steps to make your life better for the rest of your life. Step 2. Get rid of debt. Most U.S. Citizens have no more than $100,000 in debt. Let's just say for this exercise you have $100,000 in debt. Step 3. Charity brings good karma and is a great tax deduction, so take 10% of your winnings and give to charity. Step 5. Now take the rest of your winnings and put it in a safe investment yielding at least 6% per annum. Your financial advisor will be able to tell you were you can find investments that will yield 6-10% in interest SAFELY. For this exercise we'll calculate with a conservative 6%, your financial advisor may be able to help you gain a higher yield. So, $1,555,000 x .06% = $93,300 per year. If you keep this cash winnings in this investment, never touch that $1,555,000 million and leave it in that account you will receive at minimum $93,300 per year. This is your yearly salary, without working a 9-5 job, automatically. With no debt, could you live on $93,300 a year? I don't know about you, but I sure can! And as long as you take out $93,000 a year from your account or LESS, you will always be a millionaire. If you decide to take LESS than $93,000 a year . . . say $75,000 a year, you will grow your million into multi-millions within a few years! And THAT is how you win the lottery, live well and still have millions YEARS later. Now that you have a concrete plan if you win the lottery. Go buy a ticket! And good luck. I really liked the way you described the technics to keep anyone riches. I liked the calculations also. It has been hard for me to earn a living over the years of hard labor and suffering, after i lost my parents, so all man has to work for it own self and try to earn a living, grow up was not easy due to low income in the family and other side issues, i have been playing the lottery for a very long time now, and the highest amount i have won is just $750, i always pray to God to help me find a way to hit the lottery, because that was all i put my hope on, as i always play the lottery daily, buy different lottery tickets, pay for online tips and others, but all was in vain no good result , until a day i find this great Dr.Suju on the internet, he is a traditional voodoo Doctor, who help to cast the lottery spell, as was describe in the article, so i have no other option than to contact him, because i want to hit the lottery too, behold i contacted him, and he promise to help, Dr.Suju help me to cast the spell, and behold i won, i won ($15.000.0000.00) Dr.Suju is the name, but i call him great Suju, Email:Drsujuspelltemple1@hotmail.com he is the only way. I really need to get rid from debt and this is the target of 2017. Hopefully i will achieve.